There are plenty of reasons why dogs are considered man's best friend. They provide unconditional love and affection to their owners and are ferociously loyal through and through. Though it's worth considering they may have also earned that reputation for sharing some very human-like traits like, say, deciding to call it quits in the middle of a hike after getting too tired. 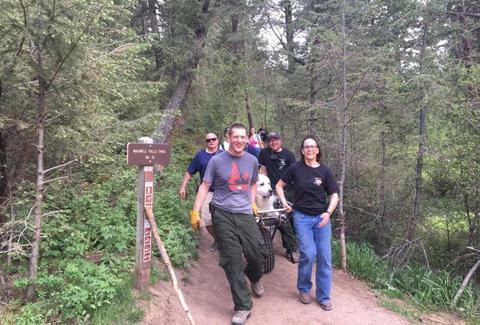 That's exactly what happened over the weekend in Colorado when a cute and fluffy Big Pyrenees had to be carried back down a trail on a stretcher by a rescue team after plopping down in the middle of a hike with his humans. During a hike on the Maxwell Falls trail near Evergreen, Colorado on Sunday, 120-pound Great Pyrenees Kato and his two human companions were roughly one mile into their trek when the 5-year-old fur baby decided he'd had enough of schlepping through the woods and plopped down, refusing to go on. He was incredibly exhausted, potentially dehydrated, and worse yet, way too heavy and unwieldy for two people to carry back down themselves. So, they put out a rescue call regarding a dog in distress, and a crew of good-spirited volunteers responded. While the situation itself wasn't necessarily as serious or involved as having to rescue an injured human hiker, it did require some human-sized equipment. Specifically, the rescue team carried the good boy all the way down on a traditional stretcher, as he regaled passersby like a monarch atop a litter. Fortunately for us (and the internet at large), his arrival back at the trail head was captured on camera. And as you'll notice, he looks pretty damn comfortable and happy to be treated to such a service. According to the public information officer for the Evergreen Fire Department who spoke to the local NBC affiliate, the owners won't be on the hook to pay for the rescue, since the crew is made up exclusively of volunteers. Kato, we we feel you, man.